"House of Leaves" is not a book, it's an experience. Mark Z. Danielewski grabs your attention, distorts your reality, makes you question your own sanity, then leaves you spent, disoriented and not quite the same as when you started this novel. It opens with a brooding, inventive and unreliable narrator Johnny Truant. Johnny brings us along as he discovers a trunk of papers inside the apartment of a recently deceased man, Zampano, who died under suspicious circumstances. The trunk contains Zampano's collection and commentary of academic dissections of a documentary film, the Navidson Record. The Navidson Record is the axis of the story-within-a-story-within-a-story framework of the book, and documents the increasingly surreal and quietly horrific experience of a family who comes home to find a door that hadn't existed before. As Johnny reads through the papers and commentary he finds that Zampano, and perhaps he himself, is losing his grip on sanity as his obsession with the house grows deeper and deeper. 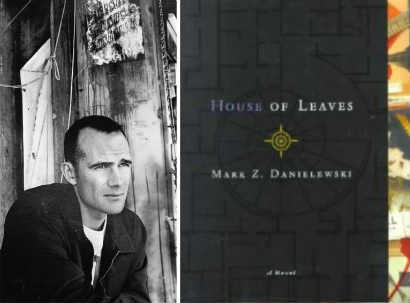 The storyline of "House of Leaves" is only a piece of the overall experience. The book's structure lends an additional layer of depth to this literary collage. The labyrinthine narrative is framed by an equally dizzying array of footnotes, lists and lists of names, texts that need to be decoded, texts that wind around the page... all of which are riddled with bland passages of intense academic discourse. Although some would argue that the layout of the book is pretentious and ostentatious, I think it's a necessary part of the overall artwork. "House of Leaves" is not an easy book to read, but it's worth the experience. The book contains a large appendix which needs to be read thoroughly in order to get as much sense of the story as possible. This book is really like a collage, and like a collage, you can't look at each individual piece... you have to look at how all the pieces fit together. If you can make it through the layers of stories, ivory tower discourses, chaotic layout and haunting images, then take a step back and look again. I get the feeling the book will mean something different to you than it did to me. I read this in 2001. It's an interesting read. I thought the House was an allegorical representation of the internet. It's always written as a hyperlink, and the door is suddenly there (as the internet was for me after I left AoL around 1998) and all the little footnotes that carry you all over the book, like pages on the internet. It's definitely got some creepy prose and does make allusions to the worrisome habit of millions of people that stare into a square of light for hours on end. No. House of Leaves was not good. It was exactly what everyone criticizes in painfully self-aware, deliberately experimental twaddle. The premise of the Navidson Record is great. A filmmaker decides to take some time off with his family and document the first years of his son's life. He rigs the new house with cameras and is ready to go. The intrusion of the house's otherness is unexpected. It starts with a door. The door is on the inside of an exterior wall. Navidson walks around the house with the camera to show that on the outside wall there is nothing. He comes back inside and opens the door and we see it leads to a corridor that could not possibly be there. It's like his house is a TARDIS. And it gets creepier from there on out as he begins to explore the constantly reshaped innards of the house. That's a hell of an idea and would make for a hell of a movie. But instead so much time is wasted with an overly hip druggie narrator who is obsessed over the writings of a delusional blind man. And it's made quite clear in the book that the blind man's papers are about a documentary that never existed and quotes from media interviews and reactions to this same documentary which was supposed to have hit the world after the video was released online. And there's footnotes after footnotes with so much time wasted. This is a book that makes you consciously aware of your life slipping away with every page you read. It makes you feel like every minute is a minute squandered. I felt an incredulous rage at having this book come so highly recommended. The last time I felt like this was reading Ayn Rand. "This is a book that makes you consciously aware of your life slipping away with every page you read" - I liked how you put this, good point. Ha! Love this.. this is what I meant by the book meaning different things to different people. To me the book is all about people confronting their deepest and darkest parts of themselves. We each build our own defenses from having to confront these demons head on. For Navidson, the house was his defense (note how it shifted and changed with his own mind). Navidson confronted the challenge head on and as he went deeper into the house the walls fell away until there was nothing left but his family. For "Zampano" it was the documentation of the Navidson record... he never confronted his demons, and so he died by the demon's hand (claw marks). What Johnny will do is up in the air. I believe that the book, House of Leaves, is Johnny's distraction from confronting his demons. He made up the entire thing to distract him from his own painful life. But then, obviously, the writing the book is Daneilewski's own defense (or maybe confrontation) of his demons... the structure is necessary to get a sense of the convolutedness of the human mind filled with distractions,walls and mazes. If you continue the pattern it makes you wonder if the book you're reading is YOUR own defenses from confronting your demons, that your mind made it up and perhaps it doesn't actually exist at all.